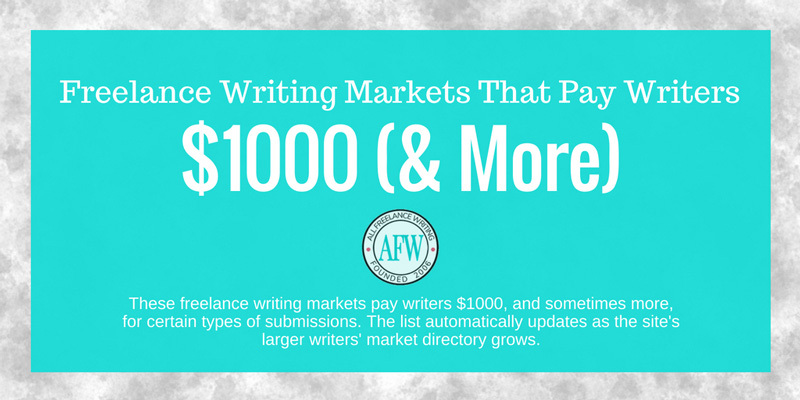 With the newly re-launched writers' markets directory here at All Freelance Writing, I have the ability to create and share specialized markets with you that will automatically update when markets are added, removed, or changed in the database. For example, if you're looking for freelance writing assignments in magazines or higher-competition online publications, this is an updated list of markets that pay $1000 (and more) for some types of assignments. Remember to check back occasionally, as this list of freelance writing markets will automatically update as I add new markets to the broader database. British Columbia Magazine is a Canadian regional magazine covering the province of BC. The magazine works with freelance writers both on spec and on assignment. Freelancers can sent queries for the following departments: Due West, Echoes, Destination, Outdoor Advisor, and Wild FilePay is $.50 per word for first worldwide print rights. Central Coast Farm & Ranch is a quarterly magazine covering the agricultural community in Ventura and Santa Barbara counties in California. They cover local food, agriculture, edible gardening, agri-tourism, and more. Pay is $.50 - $1.00 per word for features, and $350 for departments. This magazine is devoted to science fiction, fantasy, and horror. They purchase both fiction and nonfiction writing. Payment for nonfiction is 10 cents per word up to their 2500 word limit. Payment for fiction (1000-16,000 words) is 10 cents per word for the first 5000 words (and 8 cents per word over that limit). Earth Island Journal covers environmental issues such as wildlife conservation,land conversation,public policy, climate and energy, and more. Contributors are paid $.25 per word for print stories (around $750-1000 for an in-depth 4000-word feature). Online reports pay $50-100 and are a good way for new writers to break into the market. Gray's Sporting Journal accepts freelance submissions on sporting topics such as shooting / hunting and angling / fishing. They publish seven times per year, with four themed issues covering fly fishing, upland bird hunting, big game hunting, and their "Expeditions and Guides Annual." They're open to a wide range of word counts, but prefer shorter to too long (12,000 is okay if necessary, but 3000 is preferable, and 1500 words preferable even to that). In addition to articles and yarns (750-1500 word campfire tales -- can be factual or fiction), they also accept poetry up to 1000 words. They pay $600-1250 for features, $600 average for yarns, and $100 for poems. High Country News is a nonprofit news magazine covering the Western U.S. They pay $.50 - 1.50 per word, with a kill fee of 25%. They accept in-depth news and analyses from 800-1200 words, features of 2800+ words, and shorter 800-1500 word reviews, criticism, and short essays. Model Railroad Hobbyist publishes articles and videos "on all aspects of model railroading and on prototype (real) railroading as a subject for modeling." Articles typically run around 3000 words with 10 photos and a short video clip (payments being $230 for these). $200-600 per feature is typical, though they've paid over $1000 for longer articles as well (such as through their website where length isn't an issue). Northern Virginia Magazine looks for profiles and interviews with prominent and influential individuals in the region. They also accept submissions on topics such as regional getaways, art, fashion, and education. Pay varies from $50 - $1000 per story depending on research and complexity. Half the fee is paid on submission and half upon publication. They do not reimburse expenses. Sierra is a bimonthly national magazine from the Sierra Club. They accept freelance submissions for both features and departments on conservation and other environmental issues. Features range from 2000-4000 words with payments starting at $1.00 / word (and going to $1.50 / word for well-known writers). Departments run 250-1000 words and pay $250-1000 unless otherwise noted in the guidelines. Teaching Tolerance accepts both magazine articles and online contributions for K-12 educators "interested in social justice and anti-bias topics." Features run 800-1600 words. Why I Teach pieces run 600 words or less. Story Corner features student-facing short stories and nonfiction. Short articles for the website should run 500-700 words. They pay $1.00 per word for magazine contributions and $100 for short online articles. If you're looking for more freelance writing opportunities for your pitch list, you can search or browse the full collection of writers' markets. 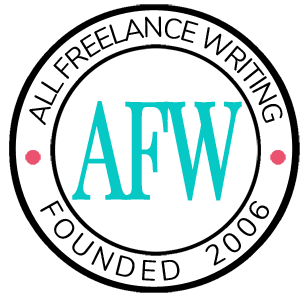 If you're an owner or editor of a publication paying freelance writers (on an ongoing basis -- not one-off gigs, which you can find here on the freelance writing job board instead), you can submit your market for consideration. This is a 2018 update of a market list originally published on August 31, 2010. Haven’t been to your site in a while, but I’m glad I paid a visit today. Even though you posted this months ago, this market list is right on time for me. Thank you. I’m keen to find new sites so I can pitch. Hopefully I can submit without much reluctance. Nervous! Great post! Quite a productive information. It surely will help freelancers like me to explore the freelance marketplace and earn some money.